Join the discussion on our forums! 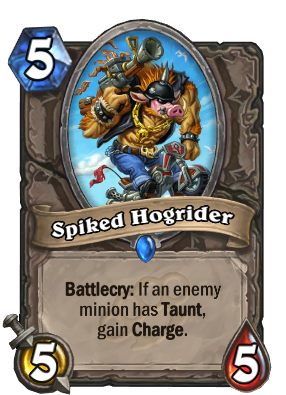 Come discuss Spiked Hogrider over in our dedicated Spiked Hogrider discussion topic. Battlecry: If an enemy minion has Taunt, gain Charge. Did you know the Hogchoppers compete every year at the Mirage Raceway? They do. It's a real group. Are those bacon strips that fly near him?! This piggy's goin' to market. First of all, not all bacon is pork. Second, he is dressed AS a pig, otherwise he would be a beast. Look at the rest of the body. Why don't you just play Black Knight? This is an arena card. If it were legendary, Black Knight would always be picked. This would be better as an ability, not a battlecry. What's the damn point of getting charge on your opponent's turn? No no. What I mean is with my idea you'd lose the charge once you kill the taunt. Meaning this would be a taunt killer. As a battlecry you're free to use a spell or other minion to kill the taunt then charge this minion face with 5 damage (or more if buffed). I don't think this is true. The battlecry triggers when you play it meaning it will still have charge even if the taunt dies. Yes, op wants the text to be "While your opponent has taunt on the board, possess charge." I was expecting it to be black. or have a mohawk. but since it is not i hope it will have a mr T impression when it attacks or have a high pitched voice. Face Control Hunter is real. Maybe he played to much Hotline Miami. i think it's supposed to be some kind of mutant Quillboar.